The Bank Draft payment method will allow your attendees/registrants to pay for their event registration via bank draft or electronic funds transfer (EFT). No installation is required. 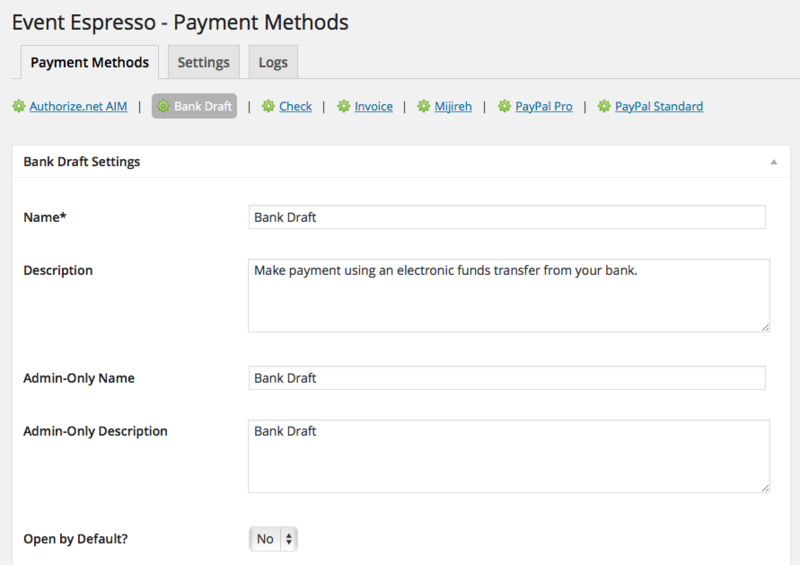 The Bank Draft payment method is included with the Event Espresso 4 core plugin. Login to your WP-admin (WP Dashboard) and go to Event Espresso –> General Settings –> Payment Methods. Once on the Payment Methods screen, click on Bank Draft and click on the button to activate the payment method. Payment Instructions – Provide clear instructions for how a payment should be made. The Bank Draft payment method will provide your registrants/attendees with information on how to make a bank transfer to pay for their event registration. I configured Bank Draft and payments are not being processed. Can you help? This payment method does not process or transfer actual funds (monies). You’ll need to provide instructions on how an attendee/registrant can pay (e.g. transfer funds to this bank account). This can be done by using the Payment Instructions field on the Bank Draft payment method settings. How can I setup a recurring payment or subscription through Bank Draft? Recurring or subscription payments are not currently supported through the Bank Draft payment method.